Read the Tata Nexon first drive review here. Update: Tata Nexon has been launched at Rs 5.85 lakh. Tata Motors will launch the Nexon compact SUV on 21 September 2017 in India. It is Tata’s first attempt at making a sub-4 metre SUV and will compete with fierce rivals such as the Maruti Suzuki Vitara Brezza, the Ford EcoSport and Mahindra’s TUV300 and Nuvosport among others. Among the four compact SUVs listed here, the Brezza and the EcoSport have managed to capture maximum attention of car buyers. Tata started official production of Nexon at the Ranjangaon facility on July 20, 2017, and dealership dispatches have also started now. Although the Nexon shares its platform with the Tata Zest and the Tata Bolt, the compact SUV is definitely more striking and modern than the latter. Tata first showcased the Nexon in its concept form at the 2014 Auto Expo. Two years later, Tata unveiled the production-ready version of the compact SUV at the 2016 Auto Expo. This version was received well by potential car buyers. Later at this year’s Geneva Motor Show, the homegrown carmaker showcased the Nexon Geneva Edition which featured cosmetic updates. Check out the Tata Nexon Geneva Edition here. The Nexon will draw power from turbocharged petrol and a diesel engines. The diesel engine belongs to Tata's Revotorq family, and is a 1.5-litre, 4-cylinder unit. The engine is NOT a 4-cylinder version of 1.05-litre, 3-cylinder diesel engine that powers the Tata Tigor and the Tata Tiago, but a new unit altogether. The petrol engine is a 1.2-litre, 3-cylinder turbocharged unit that belongs to Tata's family of Revotron engines. Both the engines will pair up with a 6-speed manual transmission, and will deliver 110PS of maximum power, making the diesel Nexon more powerful than the Brezza and EcoSport. The Nexon will also get the option of a 6-speed automated manual transmission. Click here to find out when. The Tata Nexon will be available in four equipment levels – XE, XM, XT and XZ+. The base XE variant will be equipped with drive modes (Eco, City and Sport), dual front airbags and ABS. The drive modes will alter the engine's behaviour and throttle response as per the drive setting, to either focus on efficiency or performance. As we mentioned before, the Nexon will be Tata’s first compact SUV. 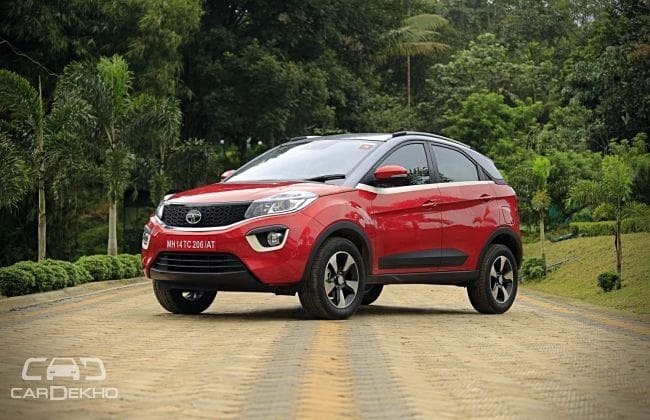 With Indian car buyers gravitating towards compact SUVs rather than sedans or hatchbacks in the last couple of years, the Nexon, if it succeeds, could prove to be a game changer for Tata.